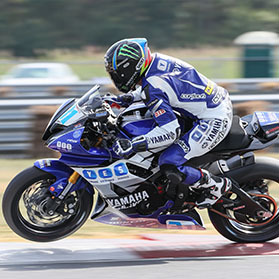 Graves Motorsports Yamaha R1 Full Stainless Steel Low Mount Exhaust System for the 2009-2014 model bikes. This unique system is extremely popular on the grass roots racing circuits. It delivers exceptional power gains and has a motoGP or "traditional" look with the one side exit point. The Stainless Steel Low exhaust features mandrel bent stainless tubing, billet aluminum flanges, and our carbon fiber side exit silencer. This R1 exhaust is extremely light. and offers the amazing horsepower increases Graves is known for! This product is intended for closed course completion use only. Use of this product for any other purpose is strictly prohibited. The O2 Sensor Bung with plug is provided for use with Dynojet's NEW Auto Tune module which allows for live, closed loop EFI tuning. An adapter is available separately for use with the factory Yamaha 02 sensor. Graves Motorsports' "Everlast" packing produces an exhaust note like no other and holds up longer to the extreme conditions of a high reving motorcycle. This full exhaust system delivers exactly what this revolutionary R1 deserves; Big power, lasting durability, style and sound.